An ivory doll. We call these inuŋuaq [doll/play person]. 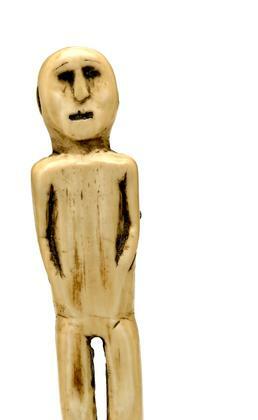 A girl’s doll, carved from walrus ivory. In Norton Sound, where walruses are scarce, some dolls were made from wood or bark. Theresa Nanouk: Maybe some people carve ivory too, huh? Theresa Nanouk: They did, huh, when you were young? 1. This section is from the discussion of ivory doll E032911.